The dismissal of U.S. Attorney David C. Iglesias of New Mexico in December 2006 followed extensive communication among lawyers and political aides in the White House who hashed over complaints about his work on public corruption cases against Democrats, according to newly released e-mails and transcripts of closed-door House testimony by former Bush counsel Harriet Miers and political chief Karl Rove. A campaign to oust Iglesias intensified after state GOP officials and Republican members of the congressional delegation apparently concluded that he was not pursuing the cases against Democrats in a way that could help then-Rep. Heather A. Wilson (R) in a tight reelection race in New Mexico, according to interviews and Bush White House e-mails released Tuesday by congressional investigators. 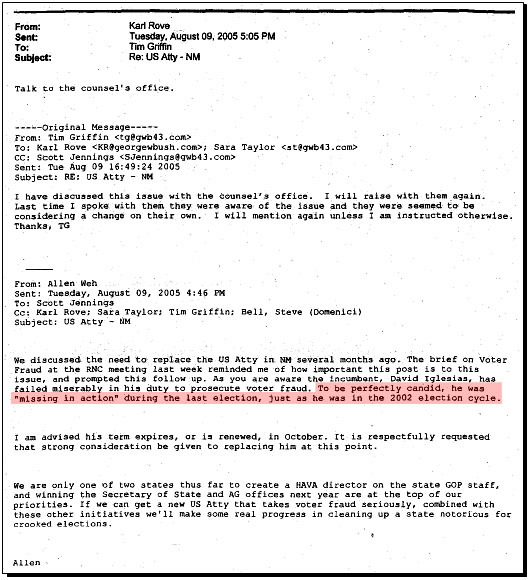 ….Miers told investigators that Rove called her in September 2006, “agitated” about the slow pace of public corruption cases against Democrats and weak efforts to pursue voter-fraud cases in the state. In the call, Miers said, Rove described Iglesias as a “serious problem” and said he wanted “something done” about it. Just to give you a taste, here’s one of the emails in question. The chairman of the New Mexico GOP, after attending an RNC meeting, emails the White House to say that Iglesias has been unhelpful in ginning up voter fraud cases against Democrats. “To be perfectly candid, he was ‘missing in action’ during the last election,” he says. Rove’s response? “Talk to the counsel’s office.” After all, if a U.S. Attorney can’t be counted on to help out during the election cycle, what good is he?